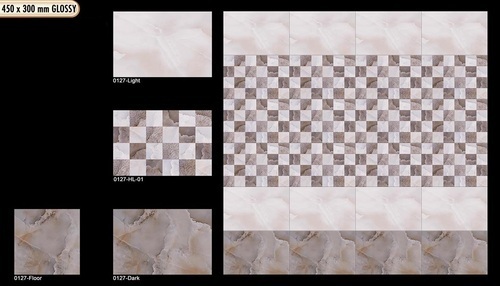 Glossy Wall Tiles 300 mm x 450 mm. Since 1994, Raj And Company is one of the reputed organizations engaged in manufacturing, importing, exporting and trading a wide range of Sanitary Ware, Sinks & Wash Basins, Tiles and Ropes. Our offered product range Gate Latch, Pad Bolt, Ceramic Sanitary Ware, HDPE / PP Monofilament Ropes, PVC Hoses & Flexible, Suction Hoses, Stainless Steel Kitchen Sinks, Ceramic Tiles, Ceramic Bathroom Accessories, Floor & Vitrified Tiles, Wall Tiles, Designer Wash Basins, Couple Suites Water Closets and many more. In addition to this range of products, our organization also offered all kinds of job work for our valued clients. To manufacture this offered range, our vendors are making use of qualitative raw-material such as stainless steel, aluminum, iron and fabric. Owing to its long functional life, low maintenance, high performance, corrosion resistance, dimensional accuracy, fine finish and sturdy construction, these products are highly acclaimed by the customers. Moreover to meet the demand of our clients, we are availing this range in various design, colors, finishes and sizes. We are blessed with a sound infrastructure facility, consisting of for warehouses. This facility is segregated various segments which are outfitted with cutting-edge technology and machines to supports us in meeting bulk and urgent requirements of our clients within the mutually decided time. Our facility managed by a panel of young, sincere and experienced team professionals, appointed on the basis of their skill and experience. To meet the all the organization goals, our team strives to maintain a good relationship with our clients to understand their specific requirements. With our client-centric approaches, larger product-line, timely execution of all the consignments, ethical business polices and wide distribution network, we have succeed in gaining the trusts of numerous number of clients belonging of various parts of Saudi Arab, Yemen, Dubai, Sri Lanka, Sudan, Morocco, South Africa and many more.